On the northern coast of South America, Suriname is one of the three small countries that usually get forgotten by those thinking about the different countries on the continent. Sandwiched between French Guiana and Guyana, with a southern border with Brazil, this country has a coastline on the Caribbean Sea and is a very interesting place to visit. Suriname's largest ethnic group is Hindustani, which makes up around thirty-seven percent of the population, which was established following a large-scale immigration from Asia to this part of South America in the nineteenth century. The population of 490,000 people also has significant populations of Creole, Javanese, and Maroons. Because of the diverse population of Suriname, there is a wide range of languages spoken in different parts of the country with the official language being Dutch. This heritage is celebrated, with the country joining the Dutch Language Union to encourage contact with other Dutch-speaking countries. 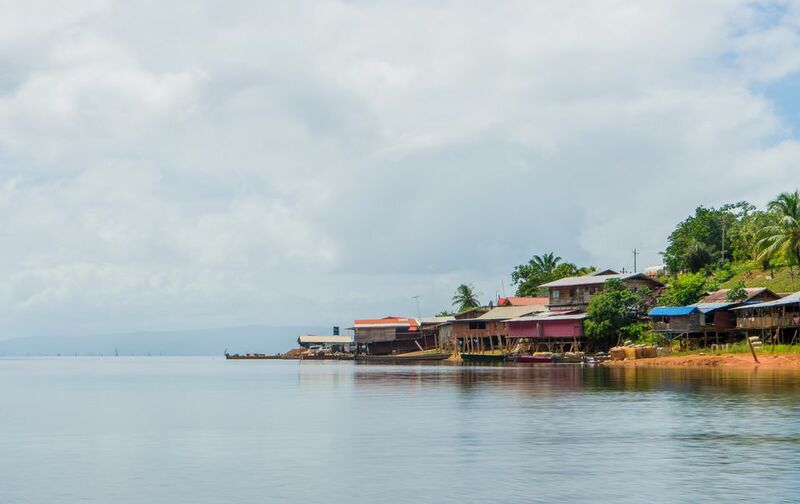 More than half of this small country's population lives in the capital city, Paramaribo, which is located on the banks of the Suriname River, and is around nine miles from the Caribbean coast. The historic center of Paramaribo is considered to be one of the most culturally interesting areas in this part of South America, with many of the buildings from the colonial period in the seventeenth and eighteenth centuries still to be seen here. The original Dutch architecture is seen more strongly in the older buildings, as the local influences crept in over the years to complement the Dutch style, and this has led to the area being designated a UNESCO World Heritage Site. One of the most distinctive foods that you can enjoy in Suriname is Pom, which reveals the blend of cultures that have helped to form this country, with Jewish and Creole origins. Pom is a dish that contains quite a bit of meat, which makes it a dish for a special occasion in Surinamese culture, and is usually reserved for a birthday party or similar celebration. The dish is made in a high sided dish with layers of the local tayer plant sandwiching chicken pieces and then covered in a sauce made with tomatoes, onions, nutmeg, and oil before being cooked in the oven. Although Suriname is an independent nation, it still retains strong links with the Netherlands, and similarly to the Netherlands, the national sport is football. While the Surinamese national side may not be particularly famous, several of the most famous Dutch footballers, including Ruud Gullit and Nigel de Jong, are of Surinamese descent. The vast majority of the territory of Suriname is made up of rainforest, and this has led to large swathes of the country being designated as nature reserves. Among the species that can be spotted around the nature reserves of Suriname are howler monkeys, toucans, and jaguars. The main export of Suriname is bauxite, an aluminum ore that is exported to several major countries across the world and contributing around fifteen percent of the country's GDP. However, industries such as ecotourism are also growing, while other major exports include bananas, shrimp, and rice. Although there is quite a diverse population, there is very little conflict between the different religious groups in the country. Paramaribo is one of the few capitals in the world where it is possible to see a mosque located adjacent to a synagogue, which is a sign of this great tolerance. Suriname is the smallest country in South America in terms of both its geographical size and its population. This makes travel to Suriname one of the easiest vacations to organize.